Did you know that August is National Peach Month? It is! And as I mentioned previously, the peaches at my local farmers’ market have been unbelievable. I ended up buying another quart of peaches on my last visit to the market, these even bigger and juicier than the last. I ended up eating most of the peaches raw. They were that good. But I had a few left, and I also happened to have a few leftover blackberries languishing in the fridge as well. While I’m normally adamantly opposed to the idea of a warm fruit crisp on an hot and humid August evening, we just happened to have a few unseasonably mild days last week, so I decided I would make an exception. I love this dessert for several reasons. It’s super easy, it uses seasonal fruits, it’s highly adaptable, it uses up leftovers, and it’s really not that bad for you. Plus it’s easy to scale the recipe up to feed a crowd if you need to. Topped with a big scoop of vanilla ice cream, it even makes a suitable summer dessert. My peaches were so ripe I didn’t bother to peel them. You can peel first if you prefer. Substitute all purpose flour for the whole wheat flour if it’s all you’ve got on hand. This recipe will work for just about any combination of fresh fruit you have on hand, as long as it will fit in a ramekin. In a small bowl, combine flour, walnuts, oats, salt, sugar, cinnamon and butter with two forks or your hands until crumbly. 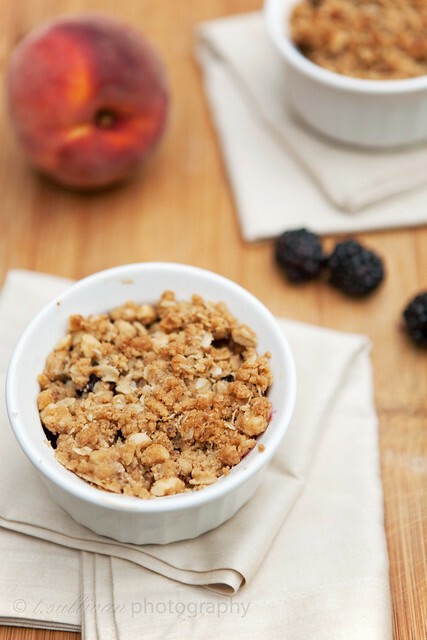 Layer chopped peach and blackberries in two 7-ounce ramekins. Top ramekins evenly with flour crumb mixture. Place ramekins on a foil lined baking sheet (in case of overflow) and bake 20-30 minutes, or until fruit is bubbly. Cool at least 5 minutes before serving. I love crisps all the time, even if it’s hot out! For some reason having oatmeal in the topping sounds weird to me but I don’t know why since I normally like oatmeal. I’ll have to try it. I made up a big batch of topping and stored it in the freezer, then whenever I want to make a small crisp, I just cut up my fruit and sprinkle it on top. So easy!